Chickpea Curry is one of my favorite dishes. It’s healthy, easy to prepare and it tastes just as good the next day for those who are busy and don’t have time for lots of cooking. Just sauté a chopped onion, add the spices, the chickpeas, incorporate coconut milk and voilà, it’s done! It’s that easy. 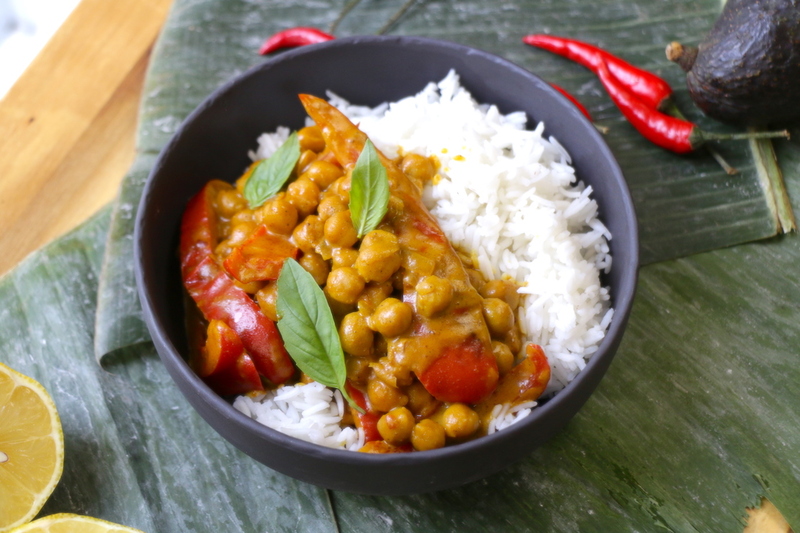 Chickpea curry is cheap, and is definitely a crowd pleaser! In a large skillet over medium-high heat, sauté the onion and bell pepper in the oil for 5 to 10 minutes. Add the curry powder, crushed red pepper, cane sugar, nutritional yeast, tomato paste and chickpeas. Stir in the coconut milk, add the salt and continue to cook the mixture, stirring occasionally, until thick and creamy (10 to 15 minutes). Serve on basmati rice and garnish with basil leaves. Is it possible to replace the nutritional yeast with something else? what is the point of the nutritional yeast? Going to make this with our vegan daughter. Thanks for keeping it simple. She is a beginner cook! Why have you added nutritional yeast in the chickpeas . OMG! I’m new to your channel and I’m so glad I found you!! I cooked and followed your recipes straight away. Newly vegan convert here. This was quick, cheap, easy and made good use of ingredients I already had… not to mention quite tasty! Many thanks for all of your great recipes and videos! This is my new favorite make in a hurry dish. The flavors work beautifully together. Thanks for another winner. Made this tonight, but improvised because I didn’t realize I was out of chickpeas until the dish was already underway, so instead I added peas and tofu cubes. It was delicious! Love all your recipes! Don’t need to pre-cook the chickpea? I used canned chickpeas which are cooked! I dinde try it but you can easily sub flour for gluten free flour in some recipes. I’ve made this 2 or 3 times now. It’s so simple and easy to make, and it tastes so good. I love curry!!!! Delicious, simple vegan recipes. What a great website to find. I am making it my mission to make all of your lovely recipes. Looks amazing!! Just one question about canola oil: isn’t it supposed to be really bad for our health? What can I put instead of coconut milk? Water or vegetable stock? Thanks! Tried this today. It was delicious! I added a TB of peanut butter as I didn’t have any nutritional yeast. I made it and thought the coconut milk left it tasting a little sweet. Don’t think I’ll make it again. That’s just my taste preference. This recipe is simply amazing. Very easy to cook. What do you think the calories are? Might be high but worth it. Thank you. I just made it and loved it! So easy and flavorful! I halved the nutritional yeast and the hot pepper, and used “lite” coconut milk. Next time I will cut the peppers and add some other veggies like broccoli and snap peas. Excellent! I’m WFPBNO & sugar free so I left out the sugar and oil, and used almond milk So easy to make, loved it! I made this for dinner last night, and it was absolutely delicious. At the end, I threw in some leftover green beans and some toasted, sliced almonds, and we ate every speck. I think this would also be delicious with tofu, but we loved it exactly as is. Thank you! Hi! Thanks for your recipes! I wanna try this but I am a celiac and I can’t find certified gluten free curry powder in Buenos Aires. Is it the same -or similar- if I use the paste??? I made this tonight and it was AMAZING!! I used coconut oil instead is canola. My new favorite dish!